Surely the very best way to spend a Saturday afternoon is eating cake with your closest friends. 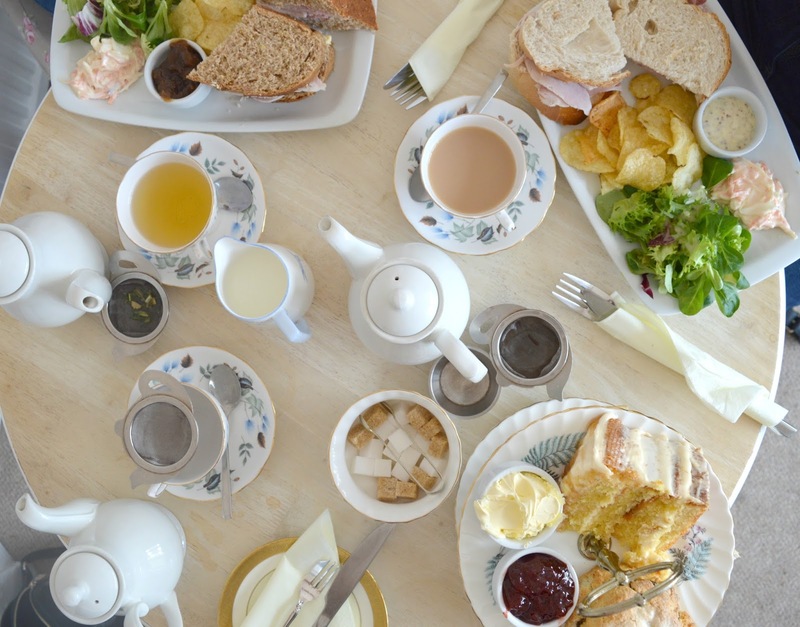 Last month I finally tried Tealicious in Durham, one of the loveliest little tea rooms in the North East. Something tells me by the end of this blog you're going to be wanting to organise a visit for yourselves! Despite Durham only being 10 minutes up the train track from Newcastle I don't often find myself there. I have no idea why because the cobbled streets, river views and delicious independents make it one of my favourite cities in the country. I meet up with Lisa and Kayleigh quite regularly for food, we have a shared passion for gossiping over pots of tea whilst eating our weekly intake of calories in one sitting. We try and take it in turns to arrange where to go, I like to think of myself as the Newcastle expert, Lisa is a pro in finding little places in the Northumberland countryside and Kayleigh is our Sunderland and Durham tour guide. It's turned into a bit of a competition now, who can find the very best places for us to enjoy our food, and after Kayleigh organised our afternoon at Tealicious I think she may be winning! You'll find Tealicious on Elvet Bridge, one of the many picture perfect streets in Durham city centre. 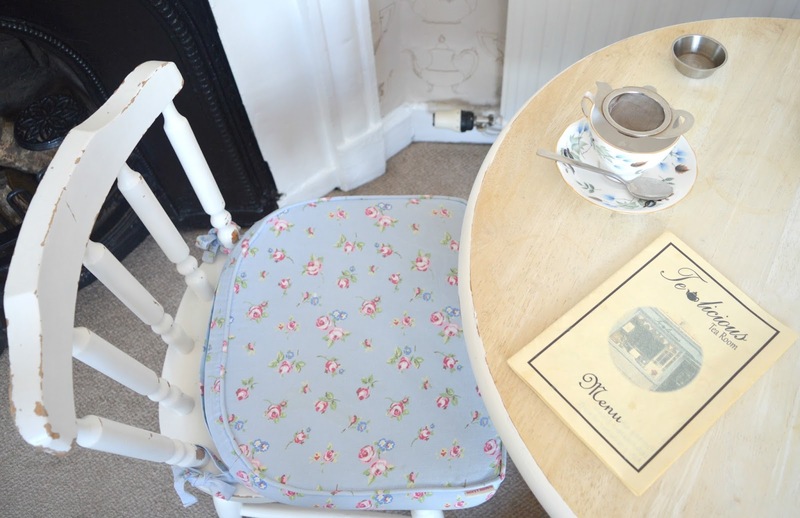 As soon as I saw it I fell in love, it's everything that I love about a tea room. Small and quaint with pretty blue windows and white furniture. It's the kind of place I can't help but press my nose up against the windows as I stroll past. One of the best things about Tealicious is that you can book a table. YES! For any other tea room fans out there you'll know how frustrating it can be trying to get into a tiny cafe on a Saturday afternoon they tend to be rammed with every seat taken and when you've travelled miles for cake it's not ideal. Kayleigh rang up the day before and secured us a table for three at 2:00 pm - a guaranteed table at prime cake eating time is exactly what you want! When we walked into the tea room we noticed it was really cosy and pretty busy but luckily our table was upstairs in a small room that we had all to ourselves for a short while, great news for me as other tea room goers don't always understand why I want to photograph my food before I eat it! The menu at Tealicious is packed with lunchtime treats, platters and, of course, all of the sweet treats you could possibly need. Luckily the menu is also available online which meant that I knew exactly what I wanted before I'd even arrived. 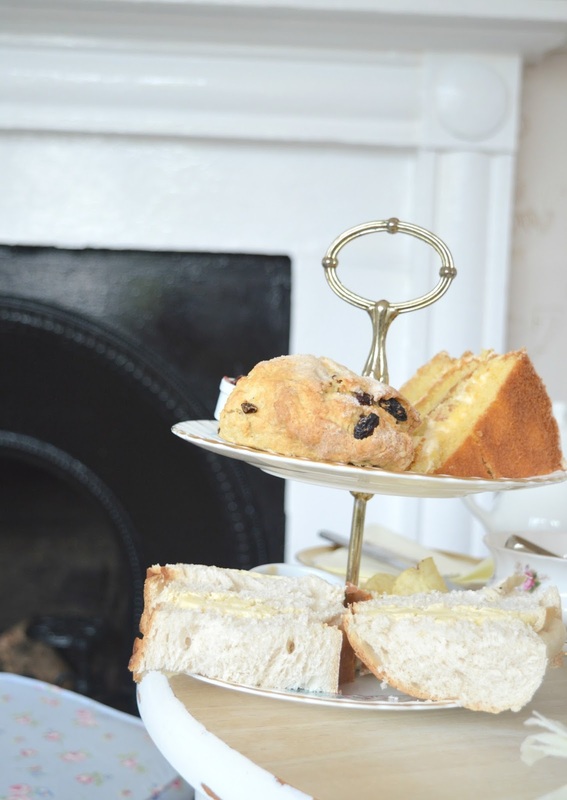 I decided to loosen my trousers and go for the High Tea for One - a sandwich, scone, a massive chunk of cake and a pot of tea all served on a mini cake stand for only £13.00. How could I ever resist? The best thing about the High Tea at Tealicious is that you get to choose what sandwich filling you want, the type of scone you'd like and, of course, you can visit the cake counter to pick out your cake. 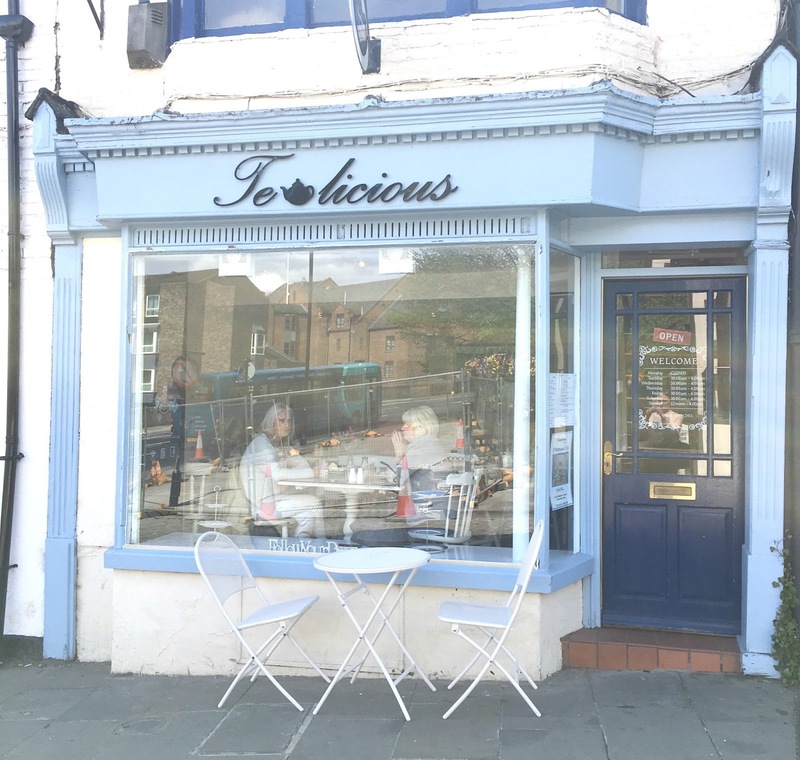 Once we'd placed our orders we had a lovely little chat with the owner of Tealicious, Alison, who has such a wonderfully inspirational story. She had always dreamt of opening her own tea room until she finally decided to go for it on her 40th birthday. How many of us waste our days wishing we had the balls to do something like that? Just seeing her pottering around her tearoom, she looked so genuinely happy to be there and it such a joy talking to someone so passionate about their work. I was over the moon when my cake stand turned up, it was like having a mini afternoon tea all to myself - very special! I say mini, but really there was a lot of food for one person, but as we all know, I am a cake eating expert and I rose to the challenge. For my sandwich I chose Regional Cheese and Chutney on chunky white bread. Freshly cut into huge doorsteps it was such an indulgent sandwich crammed full of delicious filling. I had the choice of a cheese scone or fruit scone for my stand and I obviously had to go for fruit because there was no way I could resit having my own pot of jam and cream to cover my scone in. 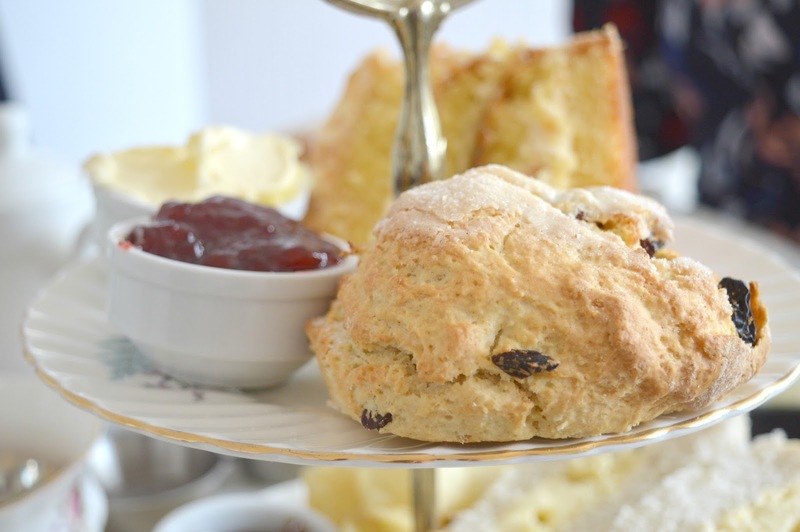 There's something so indulgent about getting a pot all to yourself, no sharing and no judgement - I was free to slather my entire pot onto my scone. When it came to picking out my cake I was a little stuck. My favourite kinds of cake tend to be beautiful flavour combinations, rather than just your classic cakes and the counter at Tealicious was so packed with tempting slices there were four I wanted! After changing my mind a few times I eventually went for the Rhubarb and Custard. A delicious sponge covered in a naughty amount of custard buttercream packed with fresh rhubarb. Oh wow! It was one of the best cakes I've ever tried (and we all know I've tried a lot!). I was completely gutted because it actually defeated me, I couldn't quite manage it all! Beautiful cakes, a wonderful atmosphere and the loveliest staff - I honestly can't shout loud enough about how much I adored Tealicious in Durham. I can't wait to go back next time I'm visiting and I know I definitely need to take Simon! Let me know if you have any recommendations of where I should try next in Durham. For more adventures across the North East be sure to follow New Girl in Toon on Instagram. It is a beautiful little place and I really couldn't get enough of the bread! I think you would love 'Flat White kitchen' in Durham. The best coffee in Durham by far and wonderful cakes. YES!!! I really want to go but there are always mammoth queues outside, I need to get up and out earlier! When the students are away in the summer it's quieter. They are open in the evenings now for food too. Not every night so best to check their website. It's beautiful inside and I think they have an outdoor area too. This looks like a dreamy little tea spot - I love being able to choose my sandwich filling (because I'm a fusspot!) and that's a beauty of a scone! OMG this looks amazing! I love an afternoon tea and have it on my list of things to do this summer so will have to check this one out!